The holidays are a time for celebration, gift-giving, and holiday parties; but if there’s one thing a CT bail bondsman knows, it’s that there’s a fine line between a celebration and an incident. In a combination of excitement, family, and time away from work, it’s not hard to have a few too many drinks and wake up with the neighbor’s Santa in your front yard or simply wake up in jail and not even remember how you got there. In that case, you may need bail for Christmas. 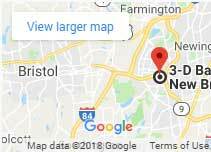 We here at 3-D Bail Bonds in Hartford, CT, have a few tips for staying off the naughty list and to keep your holiday festivities at home, not the drunk tank. 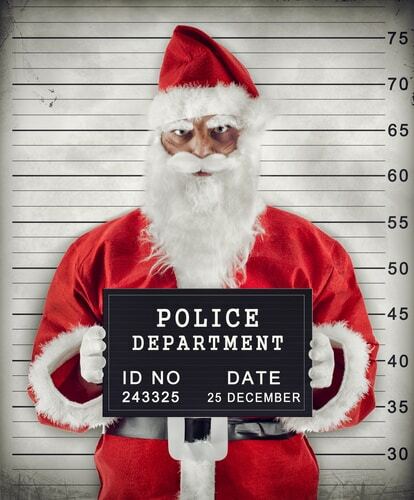 Follow your bail bondsman tips and steer away from possible arrests and incarceration during the holiday season. 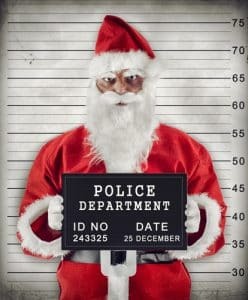 Mugshot of Santa Claus criminal under arrest. Time off from work and an occasion to celebrate are more than most of us need to leave self-control behind. The easiest way to avoid a conversation with the bail bondsman is to make sure everyone paces themselves. Above all else, if you have a holiday party, take everyone’s keys at the door. If you get the whole family together for the holidays, you’ll discuss recent updates, family matters, and, sometimes, current events. It’s up to you to predict and steer away from conversations that may boil blood. Political arguments, unresolved family issues, money problems, etc. : the less these topics are discussed, the lower the chance that someone gets bail for Christmas. Shopping and shopping without paying too much attention at what you have in your shopping cart can lead to a larceny charge. The bookings in local CT jails around this time are mostly for larceny charges, some unintentional. Well, someone had to give the family a story for next Christmas, right? There’s a quick fix here, and you don’t need to pool Christmas money to do it. Just call up the bail bondsman. They’ll get your loved one out of jail in time to enjoy the rest of the holidays—just make sure they show up for their court date. If a mistake landed your loved one in jail, don’t worry. 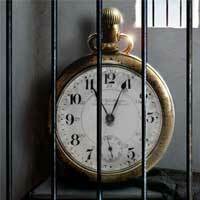 After a quick call to the bail bondsman, they can go back to enjoying the holidays. 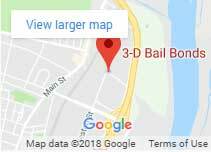 We’re standing by 24/7 at 3-D Bail Bonds, ready to post bail for those in need across Connecticut. Our staff speaks English and Spanish. Call us at (860) 247-2245 or visit our website today.